Guruji Shri Narendra Babu Sharmaji has started new section in his Bruhat Brahmanda programme called Ashtadasabhuja Durga Darshana. In which Guruji reveals the details on Lalitha Sahasranamam. Guruji have divided the Lalitha Sahasranamam into 18 sections, he plays each section and reveals the Goddess Durga Temple related to it. 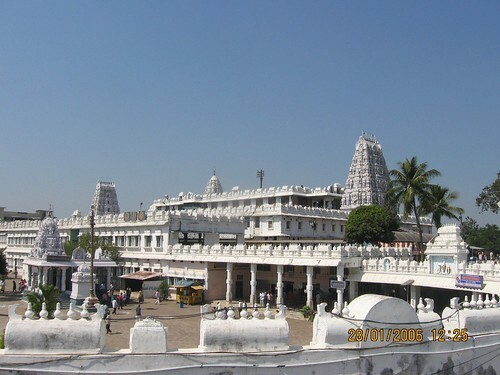 The Third Temple in Ashtadasabhuja Durga Darshan is Sree Vana Durga Devi Temple, Annavaram. The Lalitha Sahasranama verse played by Guruji, is given below. The Goddess Vana Durga Devi Shrine is located in Lord Sri Veera Venkata Satyanarayana Swamy Temple, Annavaram. It is situated at left side of the steps leading to Veera Satyanarayana temple. Goddess Vana Durga is held in great veneration and the Devi is said to be seen even to this day, in the nights, going about the holy precincts perpetually guarding the Lord. The Akriti of any temple is, according to the Agni Purana, merely a manifestation of the Prakriti. Sri Veera Venkata Satyanarayana Swamy is the presiding deity of the famous Annavaram temple atop Ratnagiri hills in the East Godavari district of Andhra Pradesh. The lord who manifested himself (Swayambhuvu) has been fulfilling the wishes of devotees for a long time. A notable feature of the temple is a unique Yantra based on Tripad Vibhuti Narayan Upanishad exists here and performance of Sri Satyanarayana Vratam, which finds mention in Revakhanda of the Skandapurana. The shrine is constructed in two storey, the lower one containing the Yantra and upper one housing vigrahas of the Lord. The idol which is about 4 metres high is in cylindrical form. The base in the lower sanctum represents Lord Vishnu and the middle portion represents Lord Shiva. The image of the deity forming a single idol and representing the Hindu Trinity is of unique attraction. In this temple premises, there is a sun dial which shows the Indian Standard Time. The Kalyana Mahotsavam of the deity during May attracts thousands of pilgrims from all parts of the State. In popular esteem temples and Tirthas that are famous for their holy antiquity are reckoned as manifesting the divine far more in abundance than places of recent origin. Yet the grace of the Lord is an ever-flowing one, and its strength cannot be tested merely by the age of temple. Just like any other institution, a temple also appears to have a cycle of its own. There are temples which have a very hoary tradition, and which have sunk into oblivion, whereas many comparatively recent temples have assumed holy and sacred importance. The Annavaram temple is an instance of the latter kind, and is an example of a temple, which is not ancient, and which is at the same time very powerful in its influence. The temple is of recent origin. There is no Sthala mahatmyam for the temple. There are also no worthwhile epigraphic records in the temple. In short, there is nothing particular to mention about the temple. All the same the temple is a famous one in Andhra and attracts pilgrims in very large numbers since the Lord here is a powerful one. The Devasthanam has got its own choultries for the convenience of the pilgrims. There are also two public choultries in the village known as the Kirlampudi choultry and the Vysya choultry where pilgrims can come and stay. There are also some rooms upon the hill, which are used as guestrooms. All these places are available for lodging and boarding. The river Pampa that is considered a sacred river is running close to the temple and is a furlong away from the foot of the hill. Generally before going to the temple pilgrims will have their bath in the river. There is no Pushkarani or temple tank in the temple. There is a pathasala attached to the temple where free boarding and lodging is provided to the students. Religious discussions are arranged during Kalyanam days and other important festival days, at the place. The popularity and importance of the temple has been growing by leaps and bounds in recent years, and pilgrims have come to consider Annavaram as a second Tirupati in Andhra. The income from the Sannidhi collections has gone up from 1.2 lakes to nearly Rs. 2.6 lakes over a period of Five years and this itself are an indication of the popularity of this temple. There are many important festivals of this temple like the Kalyanam festival in May, Devi Navaratri festival that occurs in September, the Swayamvara Vardhanti of Sravana Sudd a Ekadashi Day, Srirama Kalyana, the Kanakadurga Yatra the Prabha Utsavam, the Teppa Utsavam and the Jalatoranam. In addition to the above Dharma Sevalu and Ekadashi Sevalu are also performed. Bhishma Ekadashi is particularly sacred and important for this shrine, as the day when Bhishma, the great hero of the Mahabharata, voluntarily gave up his life on the battlefield of Kurukshetra. It was just before this that he initiated Yudhishthira into the most powerful and efficacious of all mantras viz., the Vishnu Sahasranama. This mantra is so holy and so powerful, that Adisankara, the great Advaitic teacher, has thought fit to write a commentary on it, just as he did on the other important scriptures like the Prasthana trayas. There is a Vratham called the Satyannarayana Vratham, which actually puts into practice, this sacred mantra, and this Vratham is one of the most popular and powerful of all the Vratams of the Annavaram temples. Hence the Satyanaravana Vratham which is specially dedicated to Vishnu Sahasranamam, has to be performed on the Bhishma Ekadashi day, and Annavaram, temple which is dedicated to Lord Satyanarayanaswami, is the very shrine in which the Vratham is performed with great sanctity. Hence literally thousands of pilgrims flock to the temple on the Bhishma Ekadashi day and perform this Satyannarayana Vratham in the direct presence of the Lord. The hill on which the temple is built is called Ratnagiri, and the small river that encircles the hill is called Pampa after the famous lake of the Ramayana. A mahatmya of the temple was written in recent times by a great Telugu poet, and referred to this Pampa river as Viraja of Goloka who Melted in her ecstasy of faith, and took the shape of this rivulet to remain eternally in the presence of the Lord, and dedicated herself to the services of the Lord by ever washing his feet with her holy waters. There is an interesting and popular legend about the discovery of the main idol of the Lord. The legend goes that the Lord revealed himself in a dream, where he told the local people that his vigraha was left abandoned on the hill without worship and that the local people must trace it and re-consecrates it.Thereupon, all the local residents and the then zamindars searched and discovered the idol at the foot of a tree. The worship was performed and the idol was installed a little higher at the present spot. The holy ground where Sri Ramalaya now covers the tree under which the idol of the Lord was discovered a little to the north east of the main Temple. There is in the Annavaram temple a famous and a unique Yantra the like of which does not exist anywhere else in India. The Yantra is based on the Tripad Vibhuti Narayana Upanishad, which is a part of the Devarshi sakha of the Atharvaveda. The shrine is constructed in two stories, the lower one containing the Yantra, and the upper one containing the vigrahas of the Lord. The Garbha griha of the Lord has four entrances., In the centre thereof, like a Panavattam under the Shivalinga, Tripeethas are constructed, and on the top of them over the Meru portion, the Beejakshara Samputi of the Yantra is chiseled. At the apex thereof which forms the Bindu, a monolithic pillar is constructed and on the top of the pillar the image of the Lord is in the centre, the image of the Goddess is in the right and a Shivalinga is on the left. The idols are of exquisite grace and beauty and are encaged in gold Kavachams. Thrikala archana is performed every day both to the Yantra as well as to the idols. Salagramams of great value and efficacy and Sri Chakram in crystal are also worshipped along with the main idols. On the ground floor of the Garbhalaya the idols of Aditya, Ambika, Gananatha and Maheswara are installed in the Four Corners and all these with the main idol of Lord Satyanarayanaswami in the centre form the Vishnu Panchayatanas. The main temple is constructed in the form of a chariot with the four wheels at each of the Four Corners. In front of the main temple is the Kalyana mantapa, cons- tructed and decorated with modern pieces of architecture. As we go down the way, we come across Ramalaya and then the shrines of Vana Durga and Kanaka Durga. Goddess Vana Durga is held in great veneration and the Devi is said to be seen even to this day, in the nights, going about the holy precincts perpetually guarding the Lord. The Akriti of any temple is, according to the Agni Purana, merely a manifestation of the Prakriti. This idea is further developed in the ancient texts, and the entire Silpa Sastra is based on the principle that the walls and the Vimana of the temple should be so constructed as to remind a devotee of the universe, and the Lord inside representing the Supreme Spirit, which is the core and being of the entire universe. According to these texts, the chariot is intended as a symbol of the seven Lokas underneath, and the seven Lokas above, with the Garbhalaya of the Lord, at the hearts centre ruling over the entire universe. The temple at Annavaram has been constructed to depict this idea concretely. The front side of the temple depicts the chariot. The Meru on the floor with the pillar at the centre and the idols at the top are intended to bring forth idea that the Lord not only remains at the heart’s centre but also permeates the entire universe. The wheels depicting the Sun and the Moon serve to remind us that this Juggernaut moves on the Annavaram temples satisfies both the ritualistic values and the spiritual aspirations of its devotees. Year to year, the offerings of the devotees goes on increasing, and the temple authorities are effecting improvements for the greater facilities of the public. A choultry at the station on the same lines as at Tirupati, a choultry at the foot of the hill, a suit of rooms well furnished for distinguished visitors, and similar provisions on the top of the hill, are all conveniences intended for the pilgrims. Near the Pampa River a bathing ghat is constructed with rooms to change the clothes, and with residential quarters also.To facilitate the performance of the Satyannarayana Vrata, which is the most important vrata of the temple, two huge Vratasalas are being constructed. Though the hill is a small one, and the total number of steps do not exceed 250, still a ghat road is being constructed, so that the old and the infirm, can go by road and have Darsan of the Lord. The entire temple is constructed in ideal surroundings, and a pleasing panoramic view of the countryside can be had from the top of the temple. Annavaram , the holy village of East Godavari district, Andhra Pradesh , is situated at a distence of two miles from Annavaram Railway Station on the Vijayawada-Visakhapatnam broad gauge section of the Southern Railways and 45 Kms from East Godavari District Head Quarters Kakinada Town. Annavaram village touches the foot of the sacred Ratnagiri Hill on which the temple of Sri Veera Venkata Satyanarayana Swamy is situated. Sri Veera Venkata Satyanarayana Swamyvari Devasthanam, Annavaram is well connected by both Rail and Roadways. It is Situated at a distance of 3KM from A.V.M Railway Station, the Vijayawada –Visakhapatanam Line of the Southern Railway. Madras to Calcutta, NH-5 Road is going via Annavaram. Regular Bus service is available from all near by towns. The pilgrims can have Sri Satyanarayana Swami Vari Darshan between 6.00 AM to 12.30 PM and 1.00 PM to 9.00 PM every day.